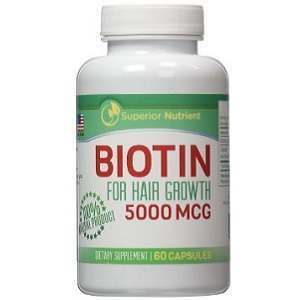 The following is a review of a supplement of Biotin which has been manufactured by Superior Nutrient. The manufacturer of the product claims that it can stop the thinning of hair and promote faster hair growth rate. Read on, to know more about the ingredients of this product as well as our opinion of whether it is the right product to take for the health of your hair. Other ingredients of this product include Gelatin, Silica and Vegetable Magnesium Stearate. Please note that Superior Nutrient Biotin is not a vegetarian product because the capsule is made up of Gelatin. This may be a problem for certain consumers especially vegans and vegetarians. It is recommended that adults take one capsule of this product daily, preferably with a meal. There are no known side effects of this product as it is made up of completely natural ingredients without any additives or preservatives. It is therefore considered safe for long term use. However, pregnant and nursing women along with anyone that is suffering from any disease or taking some other medications should consult with their doctor before using it. In case of an allergic reaction to any of the ingredients in the product, you need to discontinue use and get immediate medical attention. The price of one bottle of this product containing sixty capsules which are enough to last two full months is listed as $24.95 on the website of the company. The manufacturer also offers free shipping on every order of $35 and above. The manufacturer of this product offers a hundred percent money back guarantee without any questions asked and states that if you are not satisfied with the product and if you feel that it is not showing the desired results then you can return it within sixty days. There are no reviews of this product on the website of the company but there are a lot of positive reviews of this product on Amazon. Superior Nutrient Biotin is a product that can be used by both men and women. The manufacturer claims that it can stop the thinning of the hair and also promote strong nails and healthy skin. It can even increase the rate at which your hair grow and is made up of hundred percent natural ingredients without any preservatives or artificial ingredients. It is easy to swallow and comes with a 60 days money back guarantee. However, the ingredients of the product include gelatin and as a result makes it unfit for consumption of vegans and vegetarians. Additionally, the price of one bottle of this product at $24.95 for capsules enough to last two full months is too low. This raises some serious concerns regarding the quality of ingredients used in the product. Therefore, the bottom line is that it may not be the most ideal product for you. Click here to learn about our Top Hair Growth Treatment Products. John Brownstone	reviewed Superior Nutrient Biotin	on November 24th	 and gave it a rating of 3.5.